Astronomershave discovered hundreds of Jupiter-like planets in our galaxy. However, ahandful of the planets found orbiting distant stars are more Earth-sized. Thisgives hope to astrobiologists, who think we are more likely to find life onrocky planets with liquid water. The rocky planets found so farare actually more massive than our own. Dimitar Sasselov, professor ofastronomy at Harvard University, coined the term ?Super-Earths? to reflecttheir mass rather than any superior qualities. But Sasselov says that theseplanets ? which range from about 2 to 10 Earth masses ? could be superior tothe Earth when it comes to sustaining life. It is said that 99 percent ofall species that ever lived have gone extinct. Earth, it seems, is a toughplace to call home. Our planet has gone through Ice Ages and global warmingtrends, it has been hit by comets and asteroids (leading, in one case, to amass extinction that felled the mighty dinosaurs), and the amount of oxygen inthe atmosphere has risen and fallen over time. Our planet is always in a stateof flux, and life must adapt to these changes or die. The shifting of tectonicplates is another example of Earth?s restless nature. Continents bang together,forming mountains, only to be later torn apart. Islands grow from underwatervolcanoes, and elements are liberated from rocks when they are melted beneaththe crust. While all this geologicactivity makes us literally stand on shaky ground, scientists have come tobelieve that tectonics is one of the key features of our planet which makeslife possible. If not for tectonics, carbon needed by life would stay lockedwithin rocks. The fear today is that toomuch carbon dioxide in the atmosphere will lead to global warming. Yet toolittle carbon dioxide in the atmosphere would make Earth a much colder place,and the photosynthetic plants and algae that rely on CO2 would perish. Thedemise of these oxygen-producing organisms would leave us all gasping forbreath. According to Sasselov, Earth?smass helps keeps tectonics in action. The more massive a planet, the hotter itsinterior. Tectonic plates slide on a layer of molten rock beneath the crustcalled the mantle. Convective currents within the mantle push the plates around.For smaller planets like Mars, the interior is not hot enough to drivetectonics. Super Earths, with alarger and hotter interior, would have a thinner planetary crust placed undermore stress. This probably would result in faster tectonics, as well as moreearthquakes, volcanism, and other geologic upheavals. In fact, Sasselov saysthe plate tectonics on Super Earths may be so rapid that mountains and oceantrenches wouldn?t have much time to develop before the surface was againrecycled. Venus, only slightly lessmassive than Earth, has had a great deal of volcanic activity, but it does notappear to have tectonics. This may be because low mass planets need water tolubricate the process, and Venus lost its water long ago through evaporation.Sasselov says Earth has just enough water for tectonics to work. Tectonics onSuper Earths might be so efficient that water isn?t even needed. On the other hand, it?spossible that a SuperEarth could be entirely covered by water. Sasselov saysthat in the case of such an ocean world, most of the water will be in an exoticstate known as iceVII -- a very compressed, hard ice with a melting point above212 degrees Fahrenheit (100 degrees Celsius). Whether made of rock or ice,Sasselov says Super Earths will be only 1 or 2 times the actual size of Earthbecause they become densely compressed as they gain mass. This higher densitywill result in greater gravity. Sasselov says the most massive Super Earthwould have about 3 times the gravity of Earth. Tests of human resistance tovertical G-force, where the blood is pulled down to the legs, have found thetypical person can tolerate up to 5 Gs before losing consciousness. So whileyou might feel much heavier walking on a Super Earth, the extra gravitywouldn?t be beyond what human explorers could endure. Of course, any life thatevolved on a Super Earth would be adapted to the greater gravity, just as ahuman feels comfortable on the 1 G surface of Earth. This greater gravity means aSuper Earth can easily hold onto an atmosphere, so it would not end up with atenuous atmosphere like Mars. But the role of a planet?s atmosphere in creatingprime conditions for life can be tricky. Venus has a surface temperature ofnearly 900 F (480 C) due to the thick greenhouse atmosphere that doesn?t letheat escape. One of the biggest influenceson a planet?s climate is the star it orbits. Earth has a circular orbit 150million kilometers away from the Sun, a yellow dwarf star. This helps keepconditions warm enough so that our oceans don?t freeze over, but cool enough sothat we don?t lose all our water through evaporation. The SuperEarths discovered so far orbit a variety of stars. The first Earth-likeextrasolar planets ever found orbit a pulsar, a rotating neutron star thatemits high energy radiation. The other Super Earths orbit stars that aresmaller and cooler than our Sun. Most of the known Super Earthsare veryclose to their stars, closer than the planet Mercury is to the Sun. Eventhough these stars don?t burn as brightly as our Sun, the planets are so closethey are like burnt cinders flickering close to a fire. One such hot Super Earth isCoRoT 7-b (named for the CoRoT telescope that was used to locate the planet).CoRoT 7-b orbits the orange dwarf star TYC 4799-1733-1 once every 20 hours. This planet is nearly 5 times themass of Earth, but is less than twice as big. This solar system has another hotSuper Earth, CoRoT-7c, which is 8 times asmassive as Earth and circles the star in 3 days and 17 hours. For astrobiologists hoping tofind alien life, two Super Earths orbiting the star Gliese 581 have potential.Gliese 581, a mce_style="color: black;"> style='color:black'>reddwarf star, is cooler than our Sun. Based on their orbit around this star, planetsGliese 581-c and Gliese 581-d are thought to have habitableconditions, although some think planet ?c? might have a runaway greenhouseatmosphere like Venus. Another aspect affecting thepotential for life is the presence of a companion moon. Earth?s Moon helpsbalance our planet?s rotation on its axis. Sasselov notes that a Super Earth?sextra mass would give it a very stable rotation, so a moon would not be neededto help keep the planet in line. Missions like the Kepler spacetelescope, launched just this year, could help astronomers find many Earth-likeplanets in the years to come. Sasselov estimates there could be a hundredmillion habitable Super Earth planets just in our Milky Way galaxy. He predictswe?ll find 50 to 100 Super Earth planets in the next 5 years. The existence of so many SuperEarths could explain the ?Fermi Paradox? of why aliens have not contacted us.If our lower mass planet does not have the ideal conditions for life, alienexplorers would be less likely to look to us, choosing instead to target themany Super Earths in the galaxy. ?Earth is a marginal planet when it comes to conditions we would like to see for complex life to sustain itself,? Sasselov notes. ?In the family of Earth-like planets, the sweet spot for complex chemistry and biochemistry to emerge and sustain itself lies in planets larger than the Earth.? If aliens on Super Earths everdecided to investigate Earth to see if such a tiny world could harbor life,they would have a harder time sending rockets into space because of the highergravity on their planet. ?This could be another answer to the Fermi Paradox,?says Sasselov, ?but it?s not an insurmountable problem.? It could even be thatbecause of their deeper gravity well, aliens living on Super Earths would haveto develop a technology superior to our chemical rockets in order to explorethe universe. If other rocky worlds with life are about as young as we are, then perhaps the lack of visiting spaceships indicates there are no ancient, highly advanced alien civilizations out there. 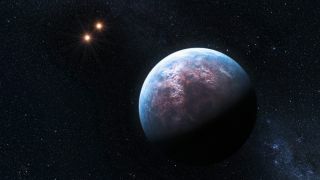 ?Most life emerges on Super-Earths with habitable potential, but Super-Earths started forming in the galaxy only relatively recently, and few technical civilizations have managed to emerge since,? Sasselov says.